Would you like to win one full year of 7-day golf membership at Chesfield Downs? Who wouldn’t?? Don’t delay!! Buy your raffle tickets from Kathy Dale – the draw will take place on Captains’ Day, 10th September. All four Section Captains invite you to enjoy Captains’ Day with us. You and your guests can play golf, enjoy our splendid Halfway House and celebrate with other members and guests in the evening with dinner and dancing. Tickets are just £25 available from Kathy Dale. 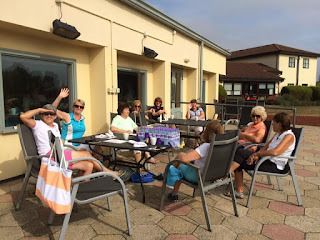 Donations Needed For Halfway House - Hilary Clark and Mary Harrison have kindly offered to run the Halfway House on Captains Day but we need donations of food. If you can provide any refreshments, please sign up on the list on the ladies notice board. Thank you all for helping. You will see that we have a brand new notice board donated by Jean Ray which is on the wall beside the wash basins in the ladies changing room. This notice board contains your handicap list, handicaps up/down, Congu rules and County information. Results of competitions will now be displayed on the sign up board. Lots more space now for all our information. A very fond farewell to Brigid Kerr, who is moving away. Brigid will be hugely missed – for her sense of humour, being able to sing a song for every occasion, always with a laugh and a joke and a smile. We wish her all the best in her lovely new home and at her new Crown golf club at Cams Hall. Good Luck Brigid - we wish you every happiness. Eclectic Cup, Thursday 1st & 8th September – This is two full medal rounds. Both are qualifying rounds, so you need to putt out on every hole, even if you have scored better on round one. Good luck and play well. Scratch Match Away At Verulam Golf Club, Friday 2nd September - Verulam are our main rivals in the division table. We will need to play well to achieve the winning position at the end of this season. Good luck ladies. Ping Pairs Final, Monday 5th September - Good Luck to Rogie and Kathy Morris who play in the Ping Pairs final. It is an excellent achievement to reach the national final of this event. Wishing them both the best of luck and hope they enjoy the day. Round 5 of the Weekend Wclectic completed. Two more rounds to go. All still to play for!! Last round of the Summer Medal Eclectic has been played. Winners of each division will be presented with their prize at our Autumn Meeting on 22nd September. 32 members of our Ladies' section enjoyed the golf at Wyboston Lakes on our annual Away Day event. A lovely course, but lots of water and rough grass to capture any stray golf balls (and there were a few lost balls on Thursday !) Pro’s tip “Keep it on the fairway” Easier said than done I think. A huge thank you to Diane Chapman and Sue Watson for organising a great day for us. The Kelland Pairs Trophy was hotly contested. Two pairs achieved 40 points and the countback went to the last 3 shots. The winning pair were Lauren Pitcher and Margaret Gentle. Just beating into 2nd place Pauline Humphrey and Brigid Kerr. Nearest the Pins were Kay Baker (who also birdied the hole!) and Kathy Morris. Longest Drive was achieved by Roz Mackenzie. Thank you to Marica Kelland who donated the crystal glass vases for our winners.